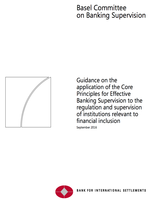 MEMOFIN - Guidance on the application of the Core Principles for Effective Banking Supervision to the regulation and supervision of institutions relevant to financial inclusion - L'information financière que vous ne trouvez nulle part ailleurs ! As stated in the foreword to the 2012 Core Principles for Effective Banking Supervision (“Core Principles”) of the Basel Committee on Banking Supervision (“Committee”), “effective banking supervisory practices are not static. They evolve over time as lessons are learned and banking business continues to develop and expand”. This Guidance is intended to help supervisors respond to changes and innovations in the products, services and delivery channels of financial institutions working to reach the approximately 2 billion adults currently unserved or underserved by formal financial institutions (“unserved and underserved customers”).2 The Guidance may also help supervisors respond to innovations not specifically designed for unserved and underserved customers. Financial inclusion can introduce potential benefits to the safety, soundness and integrity of the financial system. However, it can also bring potential risks to providers and customers alike, and entail the transfer of well known risks to new players. 3 Research at the IMF suggests that financial inclusion significantly increases macroeconomic growth, although broadening access to credit can compromise macrofinancial stability when combined with poor quality of banking supervision (Sahay et al 2015). This Guidance examines the risks presented by banks and non-bank financial institutions4 in their endeavour to reach unserved and underserved customers and, using the lens of the Core Principles, guides prudential supervisors on the application of a proportionate regulatory and supervisory approach.